I love my computer and I always love to keep my computer attractive. Desktop is one of the most used and most seen item of our computer so it is our duty to keep our desktop clean,organized and attractive. To keep desktop more attractive we need to properly arrange desktop icons, but even after arranging desktop icons, our desktop won’t look cool because of so many icons which are present in our desktop. Here is a desktop software which helps us to arrange our desktop icons in a cool way to enhance our desktop look. Fences software is desktop software which help us to arrange icons on desktop by groups. With the help of fences software we can easily place or group the icons based on categories, usage or on our interest. Fences not only helps in arranging icons on desktop but it also makes our desktop look so beautiful. Some people like to see the wallpaper on their desktop without any icons, on that time also Fences helps you, because with the help of fences we can easily hide desktop icon by single click. If you want those icons back on desktop then just double-click on your desktop the hidden icons will come back on desktop. Fences software is a free software so we don’t need to pay anything to use this software. If you looking a software to enhance your desktop look then Fences Software is made for you only. 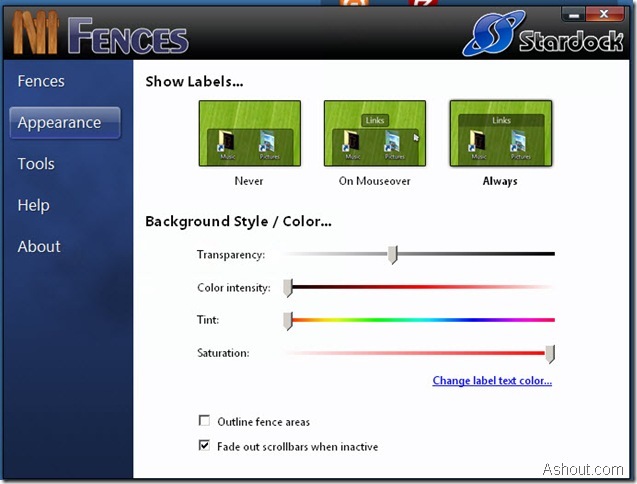 Creating Fences: To create new fences in your desktop just drag on your desktop and Right click you will see “Create new Fence here” options just select it to create Fence on your desktop. After creating fence drag your desktop icons to fences. Hide Desktop Icons: As I said above we can easily hide/unhide all desktop icons with fences software. To Hide or Unhide all desktop icons just double-click on any blank or empty desktop space. Changing Color: We can also change color of Fences in our desktop. To do so just Right click on your mouse and select Configure Fences… option. After clicking Configure Fences… option you will get Fences window in that select Appearance tab to customize Fences color. In word I can say Fence software is for those who want make their desktop beautiful. Looks like we can create a Fort in our desktop. Thanks for sharing mate. But you haven’t mentioned about the software compatibility. What are the Supporting OS for this software? Thanks sathish for pointing out. I will try to post that information in all upcoming posts. 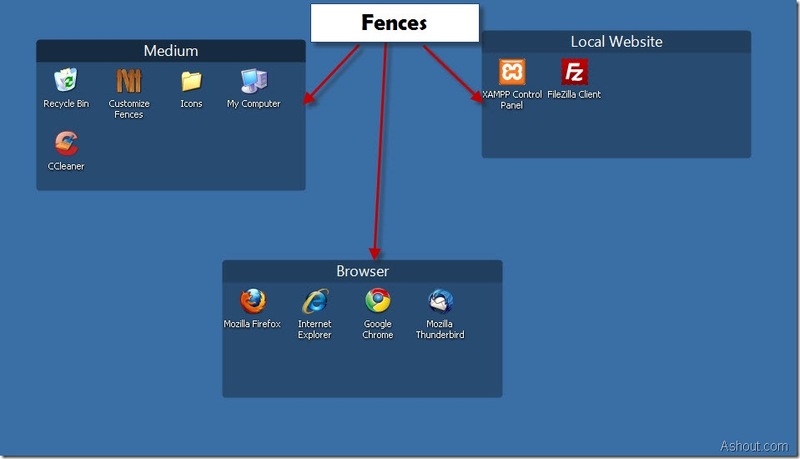 Fences works on Windows XP, Windows Vista, and Windows 7.